Indianapolis, Indiana— Safeguard America, LLC, and W. L. Gore & Associates, Inc., announce the new FireGuard 3DX glove that combines excellent dexterity and heat resistance for the back of the hands. 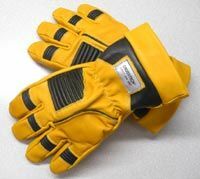 Certified to the 2007 edition of the NFPA 1971 standard, the FireGuard 3DX is the first all-leather glove with both a 3-D forchette construction and the CROSSTECH insert with DIRECT GRIP technology. The glove’s unique combination of materials and construction delivers numerous benefits for firefighters. The premium-grain leather is puncture-resistant and slip-resistant — improving protection and grip in wet or dry conditions. CROSSTECH glove inserts with DIRECT GRIP technology feature a combined thermal liner and moisture barrier that improves touch, feel, and fit. The glove’s construction provides heat resistance for the back of the hand — protection that exceeds the NFPA 1971 requirement for compressive heat resistance testing with dry and wet pre-conditioning. The advanced forchette pattern improves dexterity by minimizing seams at the finger tips, joints, and knuckles; and expandable patches on the fingers and knuckles improve flexibility by stretching when the hand is clenched. In addition, the ergonomic design of the gloves allows the hands to rest in a naturally curved position. Available with either a Kevlar wristlet or leather gauntlet, the FireGuard 3DX is the latest addition to SafeGuard America’s full line of emergency responder gloves, which include structural and extrication gloves. All of the NFPA-certified gloves are constructed with CROSSTECH glove inserts that provide outstanding protection against blood, body fluids, NFPA common chemicals, and water. At the same time, these inserts allow perspiration vapor to flow through, which reduces dry-out time and heat stress when compared to most polyurethane barriers. For more information about CROSSTECH products, visit www.GoreProtectiveFabrics.com. Founded in 1957 in Berlin, Wisconsin, Safeguard America, LLC, manufactures high-quality protective apparel, gloves, and workwear for use in challenging environments. Safeguard America is committed to staying on the cutting edge of technology as demonstrated by its recent move into a newer, larger factory as part of its acquisition of Berlin Glove. For more than 30 years, SafeGuard America has delivered innovative gloves for firefighters and first responders, leading the industry with the introduction of the FireGuard Commander with CROSSTECH glove insert with DIRECT GRIP technology. W. L. Gore & Associates, Inc., is a leading manufacturer of thousands of advanced technology products for the electronics, fabrics, industrial, and medical markets. Perhaps best known for its waterproof and breathable GORE-TEX fabric, the company’s portfolio features a diverse array of innovations, including everything from guitar strings to life-saving cardiovascular devices. Specifically in the fabrics arena, Gore has been a pioneer in developing high-performance barrier products for use in law enforcement, firefighting, EMS, technical rescue, military, and domestic preparedness applications. Gore is headquartered in Newark, Delaware, and employs 9,000 associates in 30 countries worldwide.